Single clamp allen key bolt at rear, hard black finish. It fits pretty well on my bike! The only thing is you have to be careful with your cables when installing it. This is listed as having an angle of '0 degrees', by which they do NOT mean perpendicular to the steering column (which is what I had assumed because that is the more common convention with stem labeling these days), but they actually mean parallel with the ground on a bike with a head tube angle of 73 degrees. It would more commonly be called a plus/minus 17 degree angle. This was good news for me because putting it at a 17 degree downwards angle gave me lots more room than I had been expecting, so I can mount aerobars to my regular bars (for a comfortable additional hand/arm position when touring) and still have a handlebar bag mounted below them on this mount which I can clip on and off without a problem. Excellent quality, beautiful TIG welding. Amazingly quick delivery to USA. I'll be using this to mount my Arkel handlebar bag, freeing up space on the handlebar for a headlamp. ConsMight be tricky to fit your bike. ProsWell made, well finished, functional. This is a well made and finished piece of kit, bought so that I could use 26.2 mm accessories with my 31.8 mm handlebar set up. I don't run with a lot of spacers and when first offered up to my steerer tube, it fouled the front cantilever cable stop, also mounted on the head tube. It also has the same rise as my stem so fits only just underneath the handlebars. IT WILL BE MADE TO FIT, I'll just have to adjust the brake cable run to avoid fouling. My excess accessories are an airzound horn and lights which can be mounted beneath the bar. For the record, I'm tall with long arms and like a low handlebar, all factors that make fitting this on my bike more of a challenge. If you run with a good few spacers between your handlebar stem and headset it should fit really easily. 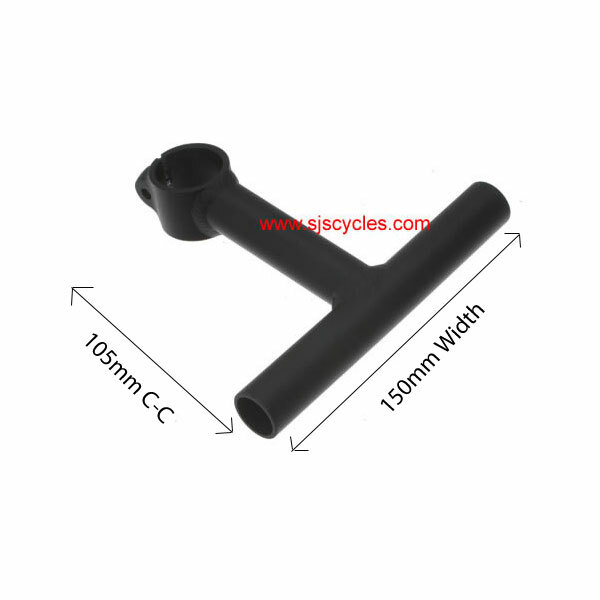 A well made quality component that make mounting a bar bag easier. "How can I fit all this junk to my handlebars?" Much better looking & stronger than other, bolt on brackets too. A simple, robust solution to vexing problems at a reasonable price. Now allows the installation of Paul Engineering Cross Levers with the Orblieb handlebar bag. Buys back valuable handlebar real estate for computers, lights, bells and gadgets of all sorts. Quality and ease of installation is far better than the Minoura Swing Grip. Nice high quality product. I had bought the shorter one but would occasionally bump my knee on the end of it when I stood to climb. So I purchased the longer (105 mm) unit and it places the cross bar just about directly under my drop bars. I have mounted Paul"Thumbies" ( Thumb shifter adaptors for Shimano bar end shifters) on it to free up real estate on the bars of my touring bike. And therein lies the rub. Road bar diameter of 26. some mm and accessory bar diameter of 22.some mm. No fault of the product by any means but if shims were made available for fitting road bar sized accessories on the T bar it would simplify the process of adding such items and increase the usefulness of this product. Thank you. Works perfectly with enough steerer tube space. I've thought about getting one for ages ( years) should have done it before. I was trying to solve a problem with an Ortlieb handlebar bag sitting too high and it blocked my handlebar lights. I purchased the Thorn to fix this problem. Unfortunately the bag still sits too high and the lights are still blocked. It didn't fix my problem but that doesn't mean it isn't a great product. For someone else this product could be the ticket. It does free up additional handlebar real estate. It does it what it is suppose to do. Installation was easy and the product is made well enough. I just wished it fixed my problem. Well made, easy to fit, does what it says - can ride in the dark now with the handlebar bag on. Simple, straightforward and robust, perfect for mounting additional lights to a bike, particularly road bikes where bar space is at a premium and probably already occupied by a computer, this will allow mounting of perhaps 2 lights (e.g. edelux on a electron mount) as well as a reflector. A mystery to me why more manufacturers dont make this kin of product. Is there a weight capacity with this T-Shaped Extension? I'm trying to incorporate a set of aerobars with my current configuration. Currently I have a handlebar bag that stands a few inches over the handlebars, preventing the addition of aerobars. Could this T-Bar support the weight of my bag, lowering it on the steering column so I can make room for aerobars? Yes, this should be suitable for most bar bags, we have not tested a weight limit as this is variable due to the customers fork. 5kg would be a suggestion of max weight. I know the colour is different, but the clamping end looks a different shape. What is the advantage of this shape over the other? These two products are the same except colour. Do Thorn Accessory Bars Come In Different Angles? Looking to mount my Ortlieb bar bag onto my Specialized Tricross. In need of an accessory bar as I need to mount below my front light's beam. The stem on the XXL frame comes angled downwards (where I'd like to keep it) and there is only just enough spacers to fit one of your accessory bars in, meaning I need an angled item. Ideally I'd be looking for 105mm extension forwards but with 20 to 30 degree angle. I'm sure you used to have them, will they be coming into stock again soon? I'm afraid the only Thorn accessory bars we have are on the website. I know its longer than what you're looking for but as you're running an XXL frame you should be able to get away with using one of the longer 172.5mm accessory bars with a 45deg angle.